If you’re like most people, you probably find yourself at a loss for words when trying to describe your favorite fireworks. My post-show comments are usually something like, “Ooh, I liked the...really loud one.” But that can change, starting right now! Outshine the brightest firework at the next show with this handy list of pyrotechnical words. It’s not a party without baked goods! And when it comes to fireworks, there are cakes — but, sadly, not of the edible variety. A cake in the fireworks lexicon is a cluster of tubes packed with shells and linked by a single fuse. Light it and the cakes set off a series of colorful aerial explosions, producing a variety of effects and colors. Though professional fireworks usually get dry, descriptive names from industry catalogs (like "100 Shots Crackle Tail to Titanium Salute and Crackling Bouquet"), consumer fireworks often get colorful, outrageous, or downright punny monikers to describe their varied effects. See, for instance, the Pyro Glyphics, Swarming Skeeters, and Red White and Boom. Stars aren’t necessarily star-shaped when they burst in the air. 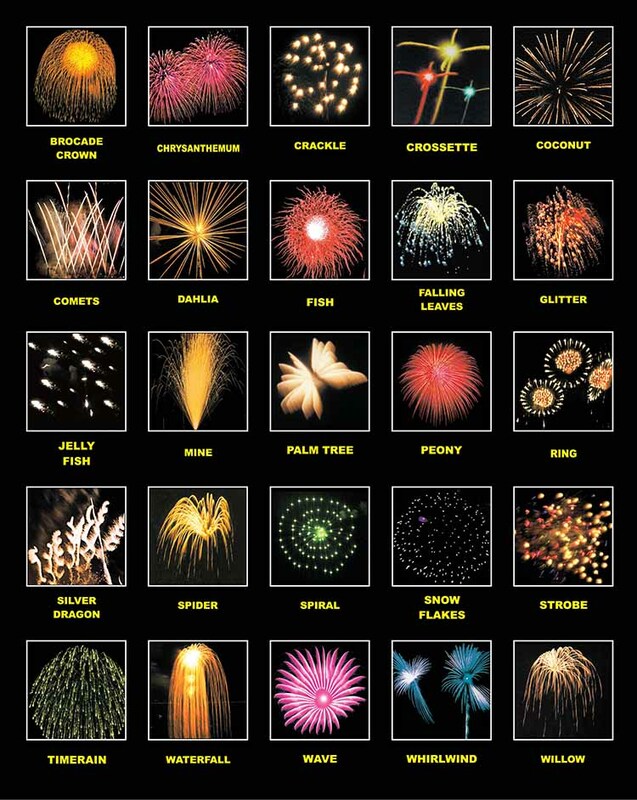 Firework effects come in a wide variety of shapes and styles, which have names like chrysanthemum, dahlia, peony, palm, and willow (sensing a trend?). One style that breaks the naming mold is the kamuro, which takes its name from a Japanese haircut style. True to its name, its glittering gold or silver explosion creates a dome-like shape in the sky that looks just like bobbed hair. Also known as red, white, and blue! A lot of chemical components go into making a firework explode into bright and beautiful shapes, but metal salts are the primary source of color. For a typical Fourth of July display, strontium salts make red fireworks, burning magnesium (and aluminum and titanium) makes white, and copper salts make blue! Other components, like calcium or iron, are added to the mix to deepen the color of the fireworks or help produce sparks and smoke. Exploding fireworks delight onlookers with their colorful bursts and booms, to be sure, but some prioritize sound over appearance. And the sound effects have their own terminology, too. You’ll hear plenty of salutes firing in the finale of any fireworks display, for example — they’re designed to create a flash followed by a loud report, so they’re responsible for the big booming finish. Crackling effects are also common. And those whistling effects? They're generally produced by small paper tubes that create a high-pitched whistle or howl as they soar through the air. We hope these firework facts added some extra sparkle to your celebration! Let us know on Twitter @PlanetWordDC. The Phantom Fireworks website's glossary and chemistry compounds page are bursting with more information about the different shapes, sizes, colors, and effects of fireworks. There are also several other firework glossaries to check out, along with this retro PBS site for a closer look at the anatomy of a firework. Anna Shuster is the Digital Media Manager for Planet Word. She studied English and Linguistics at Georgetown University.